Sausage is one of the oldest forms of processed food, and is also called by names, frankfurters, frank, weenie, wienie, wiener, dog, and ted hot. A cooked sausage consists of a combination of beef and pork or all beef, which is cured, smoked, and cooked. Seasoning may include coriander, garlic, ground mustard, nutmeg, salt, sugar, and white pepper. They are fully cooked but are usually served hot. Sizes range from big dinner frankfurters to tiny cocktail size. 18 g Textured Vegetable Protein (TVP), hydrate for 3 mins in 1/2 cup water. 2. Grind chilled meat using, 3.0 mm hole plate. 3. Chop beef and pork at low speed. Add hydrate ISP. 4. Add curing ingredients, except vitamin-C powder. 5. Add all the rest of the fillers and extenders. 6. Shift to a high speed. 7. Add all the spices/seasonings. 9. Continue cutting for thorough blending 5-7 minutes cutting time, 11-15 °C emulsion temperature. 10. Add vitamin-C powder in last minute of cutting time. 11. Run through stuffer. Link to desired length. 12. Drape in smoke and hang to dry (30 minutes -1 hour at room temperature). 13. Smoke for 30 minutes at 55 °C. 14. Increase heat to 65 °C for 15 minutes. 15. Heat clean, tap water to 75 °C. If desired, add allura red #40 to the water for color. 16. 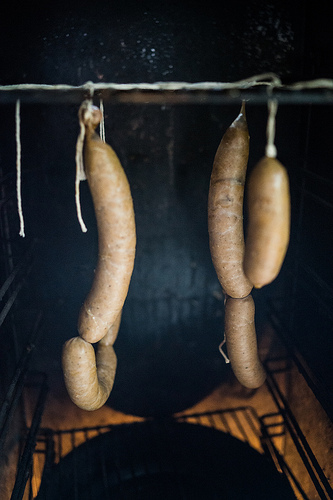 Transfer smoked sausages to the pre-heated water. 18. Shower with cool, tap water and chill. 19. Pack in polyethylene bags. 20. Store in chiller or freezer. After mixing all ingredients to the 1 kg meat, the yield of the finished product would weigh 1.3 kgs. * The higher the volume of production per day (more than 100 kg), the lower the production cost, thus further increasing the markup to more than 20%. The higher the markup, the higher the profit margin. * If price per kg is lower compared with the existing market price, increase mark-up to more than 20%.